When you mention Innsbruck to many mountain-lovers, the response will usually be related to the airport. “Ah yes I’ve flown into there before”, “oh it’s the most amazing airport descent”. Granted, it does have an incredible landing path, passing over the mountains and coming down through the Inn valley. However, Innsbruck is so much more than just a stop on a journey elsewhere. This summer, I had the opportunity to spend a few days in Innsbruck, exploring the city on a new level and spending more time seeing what this mountain destination has to offer. Spoiler – it’s a lot. So on your next trip to the mountains, why not extend your time in Innsbruck? Instead of simply flying in and out, spend a couple of days in the city, exploring the magnificent area. Whether you are a fan of food, art, history, music or sport, you will find so much to enjoy here. Below is an idea of a 48-hour summer itinerary you could take to really pack the most of Innsbruck into your stay. Of course, it barely scratches the surface of what’s available in this beautiful Alpine city, but it will definitely give you a feel of how much Innsbruck has to offer. 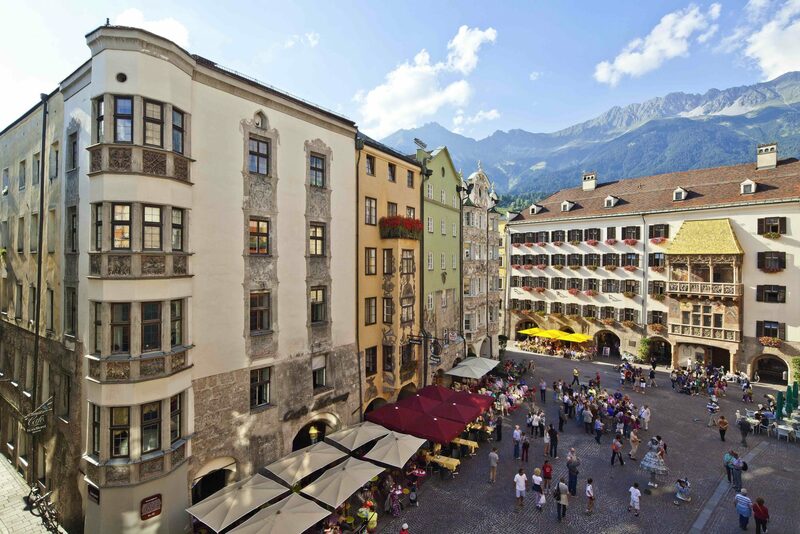 I would highly recommend arriving in Innsbruck in the afternoon, allowing you time to drop your luggage at the hotel and freshen up before heading out to one of Innsbruck’s amazing Promenade concerts. Each evening in July, free classical music concerts take place in the courtyard of the stunning Imperial Palace and provide an incredible introduction to this highly musical mountain city. Have dinner first at the elegant Cafe Sacher which is set within the courtyard itself, meaning that you can finish dessert and quickly pop a few metres across the square to take your seat for the music. Ideal! It’s your first morning in Innsbruck and there’s no better way to start your adventures than by taking a morning stroll through the Old Town to get a grasp of the beauty of the medieval history of this city. The Old Town is pedestrianised from mid-morning, so if you are visiting earlier in the day, do be careful as cars may be moving through the streets here. 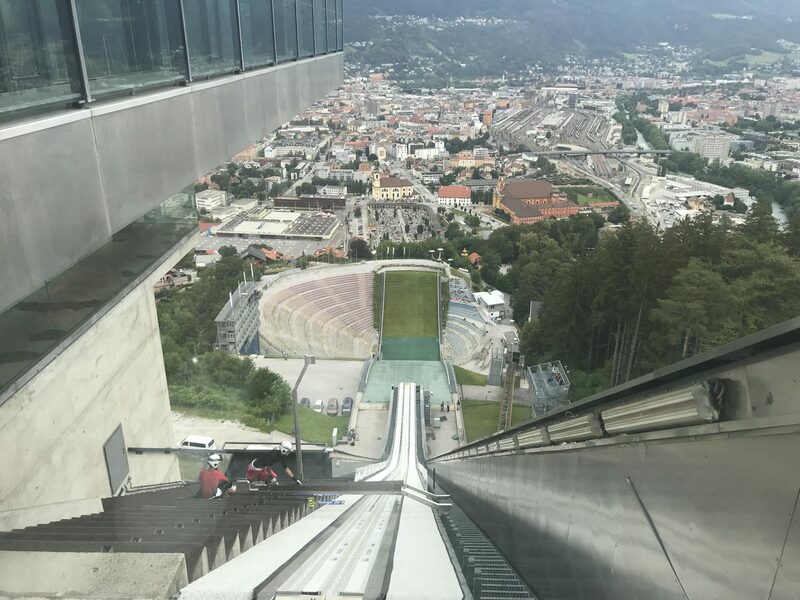 The crowning jewel in the crown of this three-time Olympic host city, the Bergisel Ski Jump is a must-visit for snow sports enthusiasts, giving a unique opportunity to see for yourself the scale of what these brave athletes come up against when it comes to ski jumping. From the base of the jump you can marvel at its size, before taking the lift all the way to the top and heading out to the viewing platform just above where the athletes begin their descent. It’s hard to imagine quite how steep the build up is Not one for those with a fear of heights. If you’re lucky, as we were, you may even catch the youngsters as they train, watching first hand as they soar through the air. It’s incredible to see in real life and they seem to spend a lifetime in the air rather than mere seconds. You will come out of this stop with a newfound respect for ski jumpers. This museum allows you to learn about the history of Tirol, with the main event the spectacular 1000m2 painting that depicts the 1809 ‘Third Battle of the Bergisel’. This huge 360 degree cyclorama offers a unique insight into the battle, in which Tyrolean rebels led by Andreas Hofer (you will learn a lot about Hofer over your time here) fought off invading Napoleonic troops. Interestingly, the space around the painting is made up to look like the battlefield itself, with cannons, discarded weapons, bullet shredded trees and grassy mounds making you truly feel like you are within the painting, experiencing the event itself. It’s a unique and engaging way to learn more about the history of the area and experience what this pivotal battle may have felt like all those years ago. At the Tirol Panorama there is an absolutely fantastic restaurant. In fact it’s worth making the journey here just to see this hidden gem of a lunch spot, perched right on the edge of the mountain and offering amazing views over Innsbruck. The dishes we tasted were fantastic. The chicken caesar salad was a definite highlight, whilst the schnizel and steak tartare are also highly recommended. For vegetarians, their take on the traditional kaiserschmarrn was an absolute delight, filling that stomach ready for more afternoon adventuring! If you have time, it’s also definitely worth taking the walk along the 2.2-kilometer Panorama Loop Trail that circles Bergisel Mountain. Offering incredible views of Innsbruck, the surrounding mountain-sides and the rushing river below, the panoramic viewpoint half way through is truly special. 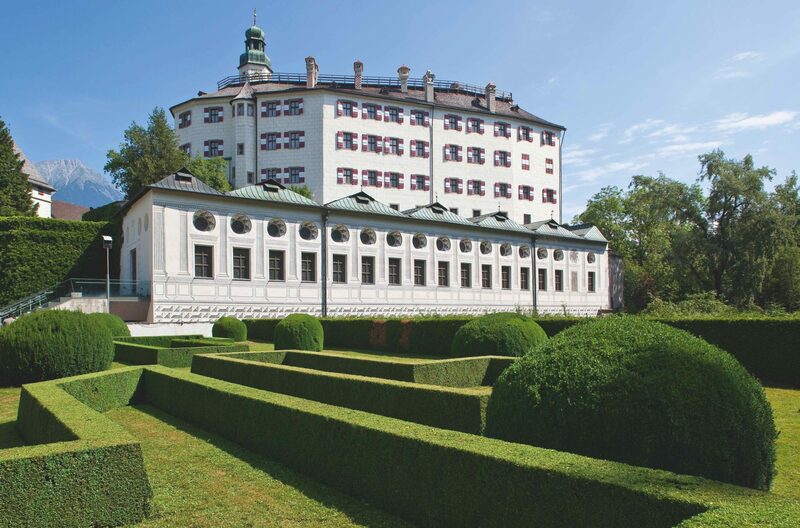 A romantic destination lying in the hills south of Innsbruck, Ambras Castle is worth a visit as much for its exquisite gardens as for its incredible historic offerings. From 1563 – 1592, Ambras Castle served as the residence of Archduke Ferdinand II, the princely sovereign of Tyrol and an important figure in Innsbruck’s history. Archduke Ferdinand II was a dedicated humanist, who built a museum on the site to house his world-famous collections, today called the ‘Chamber of Art and Wonders’. Ambras Castle is thus arguably the oldest museum in the world. The Chamber of Curiosities is a definite highlight of any visit here; weird and wonderful treasures amassed from locations across the globe that serve to demonstrate the public knowledge of the times. Easily accessible from Innsbruck town centre via a shuttle bus, Swarovski’s Crystal World is a unique experience. I will admit I was somewhat sceptical of ‘Crystal World’, my mind automatically assuming it would be some kind of twee theme park. However I will happily admit my presumptions were totally off as this was one of the highlights of my time in Innsbruck. The ‘chambers of wonder’ are curated by a variety of minds, from Tord Boontje Alexander McQueen to Manish Arora, all allowing incredible and unique ways of experiencing not just crystals, but the world around us as well. (I will also admit that my inner five-year-old was incredibly excited about seeing Cinderella’s original ‘glass slipper’). Out in the gardens there is a huge amount for children to enjoy, from a huge kids play area which is bound to make even the most serious of adults jealous, to a maze and a water .. that puts on a show every fifteen minutes. The only way I can describe this is as fountains dancing. Seriously. The ‘Daniels Kristallwelten‘ restaurant at Swarovski Crystal World is not to be missed. You may, as I did, have a slight misconception that this would be a museum-type cafe. However that could not be more wrong. One of the most stylish, sophisticated restaurants I’ve ever eaten in, it was an absolute pleasure to dine here, made all the more enjoyable by dedicated staff who cannot do enough to ensure you have a good evening. The fantastic decor within the restaurant is reminiscent of everything you learn about Swarovski here and is only outshone by the quality of the food. I would highly recommend the Thai Green Curry – one of the best I’ve ever had. You also cannot leave without sampling one of the fantastic cakes and pastries made in house. A fantastic and well-earned treat after a long day’s exploring! Take in some of the area’s most incredible views, hike through spectacular scenery and make the most of the fresh mountain air with a day exploring Innsbruck’s active side. Part of Austria’s biggest nature park, Nordkette Mountain is the perfect place to start your day. The funicular is easily found in the town centre and whisks you up to the peaks from the city centre in just 20 minutes. Exit at the Seegrube level at around 2000 metres and you’ll find the Path of Perspectives. This is a lovely trail on which to warm up your legs, with ten modern installations placed along the route to invite you to truly appreciate and enjoy the amazing natural landscape. After this, keep heading upwards, taking the cable car from Seegrube to Hafele Kar. Here you can see the most incredible panoramic views over Innsbruck and the surrounding mountains. 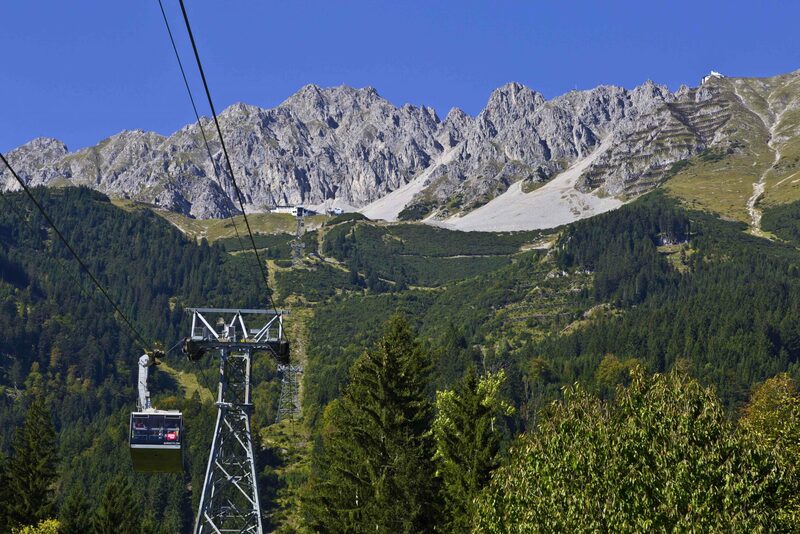 Walk up to the summit cross to get the best views and bragging rights to the summit of Innsbruck’s most famous mountain! 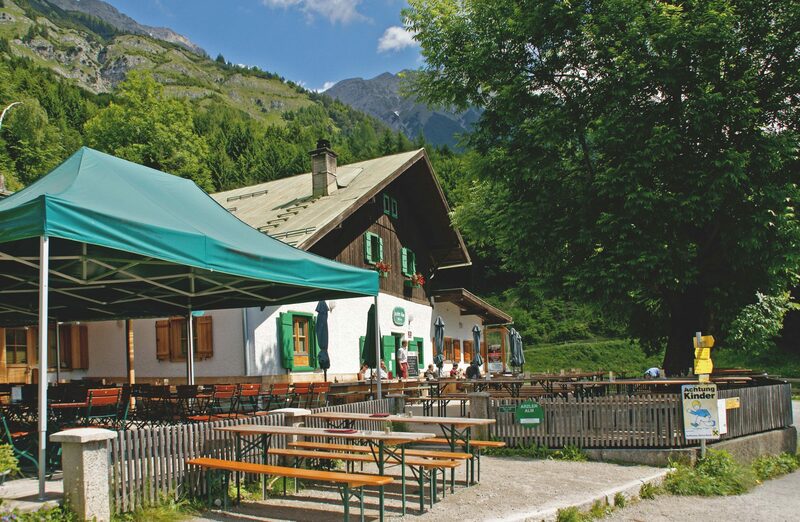 Arzler Alm is a very traditional mountain hut which has been owned by the city of Innsbruck since 1940. It’s got an interesting history; severely damaged by an avalanche in 1968, it was rebuilt maintaining the traditional charm of its original construction. This hut is popular with both locals and tourists due to its good food, beautiful views and easy access from the town – a true mountain hut escape from city life. It’s a treat to visit in the summer, with sun loungers outside allowing you to soak up the rays and even BBQ’s taking place when the weather is really nice. The menu specialises in Austrian cuisines, with the dumpling dishes highly recommended. The next part of this hike takes you through beautiful forest path that will really have you feeling immersed in nature. Here, you will suddenly come across the striking mountain hut of Umbrüggler Alm. In contrast to Arzler Alm, Umbrüggler Alm is a much more modern mountain hut, with high quality facilities and stylish decor. With light, wooden interiors, this hut is avant-garde yet with a gorgeous open fire it retains that cosiness that is so symbolic of the mountains. A stunning view over Innsbruck on the terrace allows you to truly appreciate your surroundings, both immediate and distant. With their unique modern interpretation of Tyrolean cuisine, Umbrüggler Alm is a favourite with Innsbruck residents, served alongside a selection of fantastic wines. After a few hours’ walking, it’s definitely somewhere we would recommend stopping for a drink and a little taste of Tyrol with a twist. If you’re visiting on a weekend, be sure to consider their spectacular brunches. Stage 3 – Return from Umbrüggler Alm back to Hungerburg and back down to the city. Slap bang in the centre of Innsbruck, Weisses Rössl is the oldest restaurant of the city. Dating back to 1509, this traditional eatery has a range of dining areas, including a beautiful outdoor terrace for al fresco eating on warmer evenings. Inside, charming wooden decor accompanies a fantastic menu, packed with hearty Austrian specialties that are sure to be well received after a day on the trails. The schnitzel is definitely one to try. For souvenirs, traditional trinkets or local delicacies, head to the bustling medieval streets of the Old Town, where you can bask in the atmosphere whilst perusing the shop fronts. If you’re here over the festive period, you will also find an amazing Christmas market here, as well as one nearer the river – the perfect place for a gluwhein and some present shopping! Fuel yourself up for the flight home at one of Innsbruck’s most stylish restaurants. The Lichtblick restaurant is located on the top floor of the Rathausgalerien shopping mall and offers spectacular views over the city. The food is fantastic, a creative fusion of Austrian, Mediterranean and Asian cuisine. It’s the perfect place to spend your last hours appreciating the wonders of Innsbruck. 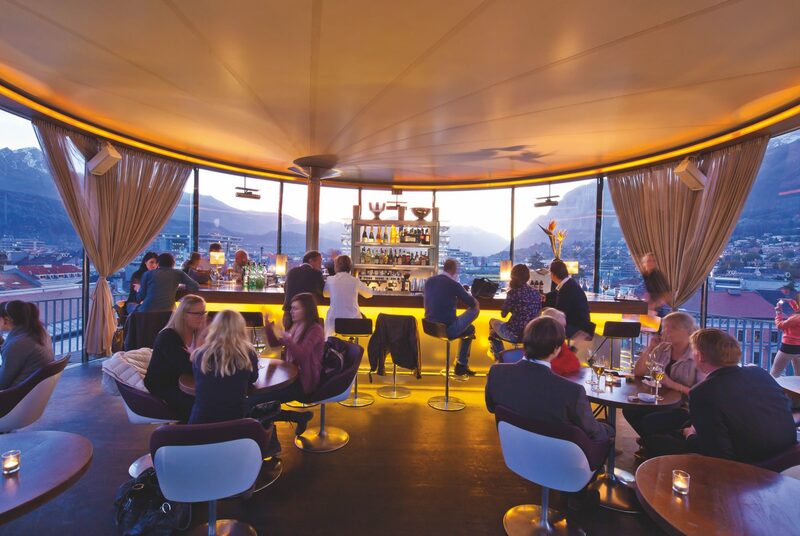 What’s more, the adjacent 360° wine bar makes the best Hugo (a popular Tyrolean cocktail consisting of prosecco, elderflower and mint) in the city, capped off with amazing panoramic views of the city. What better way to end your stay in Innsbruck?! 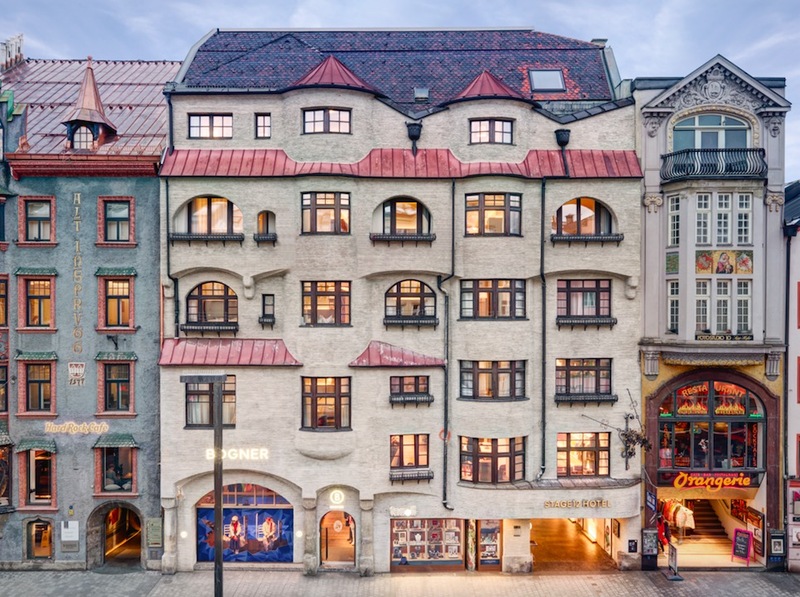 The new Stage 12 Hotel is slap bang in the centre of Innsbruck, just off the main square where shops and cafes abound, with plenty of outdoor seating creating a fantastic summer atmosphere. Despite its central location, the hotel is extremely quiet, allowing you a great night’s sleep in preparation for your days exploring. A fantastic and well- buffet breakfast is sure to keep your energy levels peaked throughout the morning and the on-site bar offers an extensive range of drinks and cocktails and does a roaring trade on weekends, when the atmosphere is really electric. As it’s slightly set back from the main street, this really is a local secret, a hidden gem, some would say. The decoration throughout is modern, sleek and sophisticated, from the stylish reception through to the incredible showers. There’s even a lovely relaxing spa area, with two saunas and a steam room if you can fit in a quick relaxation session. This is simply a few days in Innsbruck. If you have more time, why not take a schnapps tour, explore the beautiful churches or try mountain biking down one of the many trails on the Nordkette. There’s a huge amount to do here. The Hofburg – the incredible former Imperial palace where you can learn about the hugely interesting history of the ruling family – a guide is recommended here to really grasp the scale of this incredible history. Glockengiesserei Grassmayr – a fascinating museum demonstrating the history of the age-old Grassmayr bell foundry. You may not have ever thought about how bells are made before, but after a visit here, you will have a newfound respect for those who create these unique pieces. 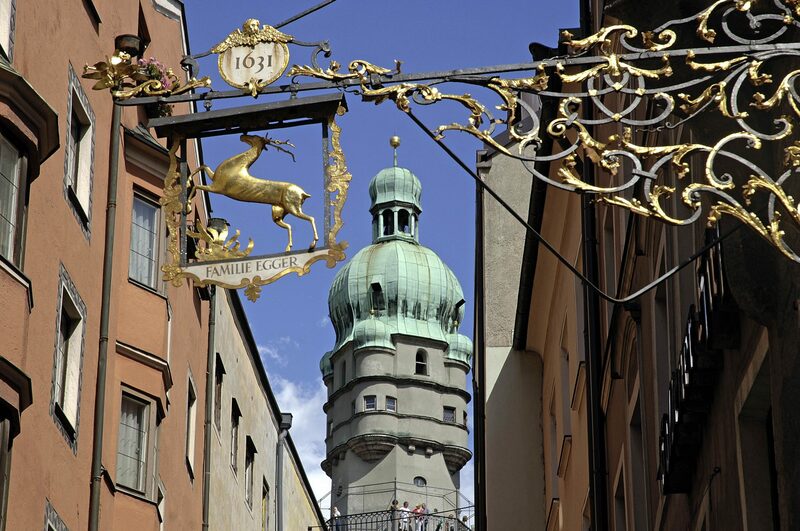 Innsbruck City Tower – Built between 1442 and 1450, this tower was an observation point for sentries. The sentries announced the hours of the day as well as maintaining order and looking out for danger at night. 148 steps take you to the top, where you can drink in great views of Innsbruck and the Nordkette mountain range.